The Bore Track is a shorter and more interesting way to travel from Cameron Corner to Innamincka. 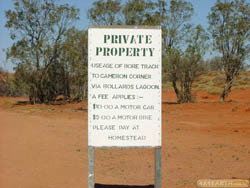 This route avoids much of the wide gravel oil and cattle road of the Strzelecki Track by using initially a private track on Bollards Lagoon station. (A small fee ($10 in 2007) is payable at the homestead but this is more than recouped by the fuel saving as this route is 80 km shorter). This narrow station track travels generally north, often on the claypans of the interdunal troughs. It occasionally crosses red sand dune ridges and has sections of loose stony ground. After 65 km the Bore Track enters the Innamincka Regional Reserve which is unique as the oil and gas, cattle, and tourism industries coexist in harmony. Many oil and gas structures appear and for a short while the track improves. After making a left turn at Gps ref -28.364922 / 140.940955 (unmarked) the Bore Track is rejoined for a tougher winding section which is narrower and sometimes overgrown, with more soft dunes to cross. 111 km after leaving Bollards Lagoon this section of the Bore Track ends when it joins a major oil road. On my 2003 trek along the complete Bore Track I towed a Kimberley Kamper trailer with no problems. )Innaminicka is on a permanent lagoon of Cooper Creek. Nearby is the Dig Tree and many of the sites where the Burke and Wills tragedy unfolded. There is good camping at the town common and several other sites on the lagoon as well as Cullyamurra Waterhole to the east. This small community has most services an outback traveller requires including a coin operated shower block opposite the Innamincka Trading Post. Innamincka is a true crossroads to adventure with the Cordillo Downs Road heading north towards Birdsville, east is the Adventure Way to Thargomindah, south is the Old or the New Strzelecki Tracks to Lyndhurst or west is the Birdsville Track via Walkers Crossing. Allow a couple of days to visit the magnificent Coongie Lakes which is 110 km to the north west.